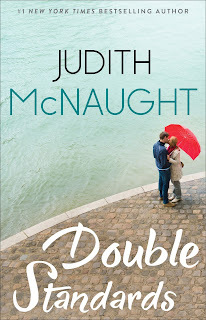 As McNaught-E November draws to a close, I'm pleased to share one more amazing excerpt, this time from a standalone contemporary novel by Judith McNaught entitled Double Standards. 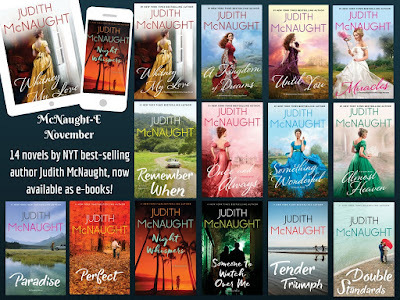 If you're interested in reading excerpts from a few of McNaught's historical romances, be sure to follow the links below. I hope you've enjoyed reading these teaser chapters as much as I have! Let me know if you've read any of the books and share what you think of them in the comments section! “She does,” he sighed irritably. “I agreed to interview her for a position with us. Tell her I’ll see her in a few minutes.” He flicked the button off and returned his attention to the vice-president, who, though preoccupied, was regarding him with curiosity. “It’s a courtesy interview,” Philip explained with an impatient sigh. “Her father is a shirttail relative of mine, a fifth or sixth cousin, as I recall. Danner is one of those relatives my mother unearthed years ago when she was researching her book on our family tree. Every time she located a new batch of possible relatives, she invited them up here to our house for a ‘nice little weekend visit’ so that she could delve into their ancestry, discover if they were actually related and decide if they were worthy of mention in her book. Philip Whitworth’s secretary glanced at the young woman, wearing a crisp navy blue suit and white ascot-style blouse, who was seated across from her. The woman’s honey-blond hair was caught up in an elegant chignon, with soft tendrils at her ears framing a face of flawless, vivid beauty. Her cheekbones were slightly high, her nose small, her chin delicately rounded, but her eyes were her most arresting feature. Beneath the arch of her brows, long curly lashes fringed eyes that were a startling, luminous turquoise blue. “Mr. Whitworth will see you in a few minutes,” the secretary said politely, careful not to stare. Lauren Danner looked up from the magazine she was pretending to read and smiled. “Thank you,” she said, then she gazed blindly down again, trying to control her nervous dread of confronting Philip Whitworth face to face. Fourteen years had not dulled the painful memory of her two days at his magnificent Grosse Pointe mansion, where the entire Whitworth family, and even the servants, had treated Lauren and her mother with insulting scorn. . . . The phone on the secretary’s desk buzzed, sending a jolt through Lauren’s nervous system. How, she wondered desperately, had she landed in this impossible predicament? If she’d known in advance that her father was going to call Philip Whitworth, she could have dissuaded him. But by the time she knew anything about it, the call had been made and this interview already arranged. When she’d tried to object, her father had calmly replied that Philip Whitworth owed them a favor, and that unless Lauren could give him some logical arguments against going to Detroit, he expected her to keep the appointment he’d arranged. Lauren laid the unread magazine in her lap and sighed. Of course, she could have told him how the Whitworths had acted fourteen years ago. But right now money was her father’s primary concern, and the lack of it was putting lines of strain into his pallid face. Recently the Missouri taxpayers, caught in the vise grip of an economic recession, had voted down a desperately needed school-tax increase. As a result, thousands of teachers were immediately laid off, including Lauren’s father. Three months later he had come home from another fruitless trip in search of a job, this time to Kansas City. He had put his briefcase down on the table and had smiled sadly at Lauren and her stepmother. “I don’t think an ex-teacher could get a job as a janitor these days,” he had said, looking exhausted and strangely pale. Absently he’d massaged his chest near his left arm as he had added grimly, “Which may be for the best, because I don’t feel strong enough to push a broom.” Without further warning, he had collapsed, the victim of a massive heart attack. Even though her father was now recovering, that moment had changed the course of her life. . . . No, Lauren corrected herself, she had been on the verge of changing the course herself. After years of relentless study and grueling practice at the piano, after obtaining her master’s degree in music, she had already decided that she lacked the driving ambition, the total dedication needed to succeed as a concert pianist. She had inherited her mother’s musical talent, but not her tireless devotion to her art. Lauren wanted more from life than her music. In a way, it had cheated her of as much as it had given her. What with going to school, studying, practicing and working to pay for her lessons and tuition, there’d never been time to relax and enjoy herself. By the time she’d turned twenty-three she’d traveled to cities all over the United States to play in competitions, but all she’d seen of the cities themselves were hotel rooms, practice rooms and auditoriums. 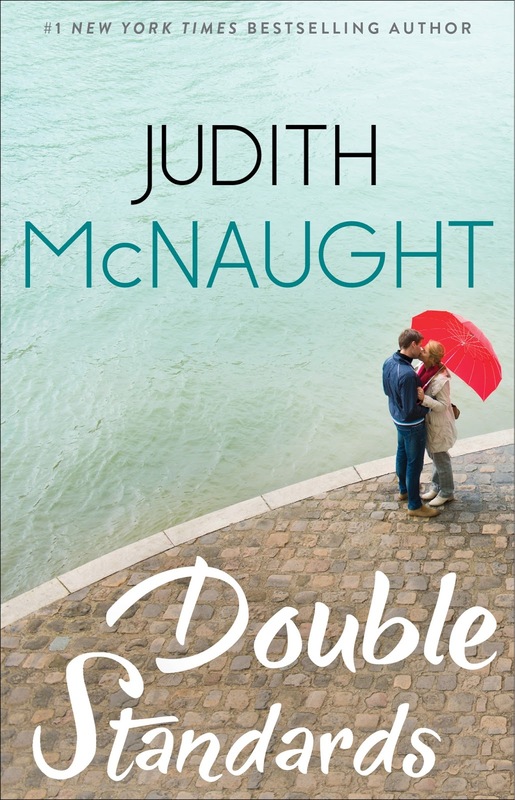 She’d met countless men, but there was never time for more than a brief acquaintance. She’d won scholarships and prizes and awards, but there was never enough money to pay all her expenses without the added burden of a part-time job. Still, after investing so much of her life in music, it had seemed wrong, wasteful, to throw it away for some other career. Her father’s illness and the staggering bills that were accruing had forced her to make the decision she’d been postponing. In April he had lost his job, and with it his medical insurance; in July he had lost his health as well. In past years he had given her a great deal of financial help with school and lessons; now it was her turn to help him. At the thought of this responsibility, Lauren felt as if the weight of the world was resting on her shoulders. She needed a job, she needed money, and she needed them now. She glanced around at the plush reception area she was seated in, and felt strange and disoriented as she tried to imagine herself working for a huge manufacturing corporation like this one. Not that it mattered—if the pay was high enough, she would take whatever job was offered to her. Good jobs with advancement opportunities were practically nonexistent in Fenster, Missouri, and those that were available paid pitifully low in comparison to similar jobs in huge metropolitan areas like Detroit. Lauren followed her to a richly carved mahogany door. As the secretary opened it, Lauren uttered a brief, impassioned prayer that Philip Whitworth wouldn’t remember her from that long-ago visit, then she stepped into his office. Years of performing in front of an audience had taught her how to conceal her turbulent nervousness, and now it enabled her to approach Philip Whitworth with an outward appearance of quiet poise as he got to his feet, an expression of astonishment on his aristocratic features. “I’ve brought you a résumé,” Lauren said, removing an envelope from her shoulder purse as she sat down. Lauren leaned back in her chair, a little dazed by the unexpected direction the interview had taken. It was rather disconcerting to discover that, despite his outwardly cold, aloof attitude fourteen years before, Philip Whitworth had apparently thought Gina Danner was beautiful. And now he was telling Lauren that he thought she was, too. While he read her résumé, Lauren let her gaze drift over the stately splendor of the immense office from which Philip Whitworth ruled his corporate empire. Then she studied him. For a man in his fifties, he was extremely attractive. Though his hair was silvering, his tanned face was relatively unlined, and there was no sign of excess weight on his tall, well-built body. Seated behind his huge, baronial desk in an impeccably tailored dark suit, he seemed surrounded by an aura of wealth and power, which Lauren reluctantly found impressive. Seen now through the eyes of an adult, he didn’t seem the cold, conceited snob’ she remembered. In fact, he seemed every inch a distinguished, elegant socialite. His attitude toward her was certainly courteous, and he had a sense of humor too. All things considered, Lauren couldn’t help feeling that her prejudice against him all these years might have been unfair. Philip Whitworth turned to the second page of her résumé, and Lauren caught herself up short. Exactly why was she having this sudden change of heart about him, she wondered uncomfortably. True, he was being cordial and kind to her now—but why wouldn’t he be? She was no longer a homely little nine-year-old; she was a young woman with a face and figure that made men turn and stare. Had she really misjudged the Whitworths all those years ago? Or was she now letting herself be influenced by Philip Whitworth’s obvious wealth and smooth sophistication? “Although your university grades are outstanding, I hope you realize that your degree in music is of no value to the business world,” he said. Lauren instantly pulled her attention to the subject at hand. “I know that. I majored in music because I love it, but I realize there’s no future in it for me.” With quiet dignity she briefly explained her reasons for abandoning her career as a pianist, including her father’s health and her family’s financial circumstances. “Yes,” Lauren said, but at the mention of her secretarial background her enthusiasm began to fade. “But I don’t want to be a secretary,” Lauren sighed. “But even so . . .” Lauren started to protest. “Is there anything else I could do in a corporation such as yours that would pay as well as being a secretary?” Lauren asked. Inwardly Lauren sighed, but she knew she had no choice. She had to make as much money as she possibly could. “I’m not asking you to spy on another corporation, I’m asking you to spy on mine. Let me explain. In recent years, a company called Sinco has become our biggest competitor. Every time we bid on a contract, Sinco seems to know how much we’re going to bid, and they bid just a fraction of a percent less. Somehow, they’re finding out what we’re putting into our sealed bids, then they cut the price of their bid so that it’s slightly lower than ours and steal the contract from us. The figure he named amazed Lauren, and it showed. It was considerably more than her father had been making as a teacher. Why, if she lived frugally she could support her family and herself. “Good,” Philip said promptly. Picking up his telephone he called Sinco’s number, asked for the personnel manager, then handed Lauren the phone to make an appointment. Lauren’s secret hope that Sinco might refuse to see her was instantly dashed. According to the man she spoke to, Sinco had just been awarded a large contract and was in immediate need of experienced secretaries. Since he was planning to work late that night, he instructed Lauren to come at once. Afterward Philip stood up and put out his hand, clasping hers. “Thank you,” he said simply. After a moment’s thought, he added, “When you fill out their application form, give your home address in Missouri, but give them this phone number so that they can reach you at our house.” He wrote a number on a note pad and tore off the sheet. “The servants answer it with a simple hello,” he explained. Did you ever post the winners of the E book giveaway?